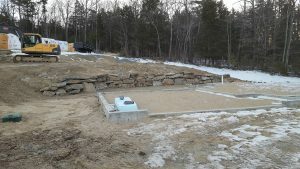 At Keenan Excavating, we take great pride in every project we do, treating it as if it were our own. Before we put a bucket to the ground, we thoroughly review your project plans and assess your needs. Site work must be done correctly for the remainder of a project to go smoothly and for your investment to last. We understand Maine’s unique and challenging terrain, and can determine the best approach for lasting results. We handle full site work from concept and design to final site preparation, and everything earth-work related in between. We have packages available for underground utilities and drainage systems, so you only need to work with one contractor through your entire project. Our team is the best – call us today to learn more about our full-service excavating! We will work with you to develop a site plan that meets your goals, and guide you through the steps of your project. 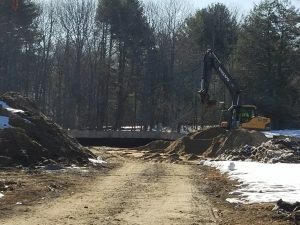 Whether you need a lot cleared and graded, a new building foundation, or repairs to an underground system, we are here to work with you to turn your vision into reality. Our customers return to us because they know we are easy to work with, listen to your needs, and treat your property in a respectful manner. We do install large-scale lawns, and offer screened loam for delivery when it is available. Please call us for more information on our lawn installation services. Our experienced crew is skilled in reviewing plot plans, grading specifications, and adhering to the conditions of the project. We are known for our organized approach to a new project, getting out ahead of it so we can be proactive and efficient, and deliver what you need quickly and on time. 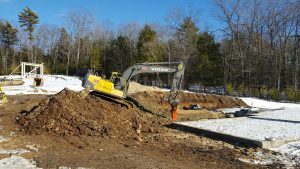 Whether your building needs an addition or expanded parking, or you have a new development to go in, we specialize in providing the best excavating services on small to mid-sized commercial site work projects.